Long-Term Corrosion Protection of Existing Hydraulic Steel Structures - Stage 1 prize competionWASHINGTON - Brenda Burman, Commissioner of the Bureau of Reclamation, announced that five individuals were awarded a total of $47,500 for their innovative solutions to protect large hydraulic steel structures from corrosion during Stage 1 of the Long-Term Corrosion Protection of Existing Hydraulic Steel Structures Prize Competition. The Long-Term Corrosion Protection of Existing Hydraulic Steel Structures Prize Competition was initiated as a mechanism to generate novel solutions to protect Reclamation’s hydroelectric penstock pipes and gates from corrosion for fifty years or longer, and with minimal maintenance and installation costs. Several supersonic material deposition metallization processes, including high velocity laser accelerated deposition. These can be performed at ambient temperatures and atmospheric conditions, do not require grit/shot blast cleaning of the substrate in a first pass, achieve far superior bonding over epoxy coatings, allow for the application of composite materials in a single pass to enable both corrosion and abrasion resistance, and provide superior protection, all at reasonable cost. Atmospheric pressure vulcanized rubber protective sheeting. The uncured sheet rubber can be applied to steel structures in the field, and the vulcanization process is carried out at atmospheric pressure. The approach does not release organic solvents that could affect workers or the environment, and end-of-life disposal is safe. The environmental durability of rubber is demonstrated by the success of vulcanized EPDM commercial roof and pond liner membranes, as well as the persistence of scrap tires in the environment. Organometall-phosphato polymer is fined dispersed within an epoxy modified polysulfide coating and chemically cured to provide a dual corrosion protection mechanism. The approach is expected to be in the range of $120/gallon (compared with $100/gal for the polysulfide epoxy alone). The formulation may be applied by spraying from a two-component mix and is solvent and volatiles free. Use of highly underutilized cold spray technique that applies a solid at a speed that converts aluminum to a liquid as an untreated metal coating application. Because this process does not produce noxious fumes, it is much safer for the operator, and for the environment. Provides long-term corrosion protection of existing hydraulic structures by using the novel, existing, cost-competitive, and environmentally friendly technology of cold-spray (supersonic particle deposition) to apply an alloy of highly corrosion-resistant titanium, and a non-reactive noble metal (such as ruthenium or palladium) to the geometries of infrastructures. 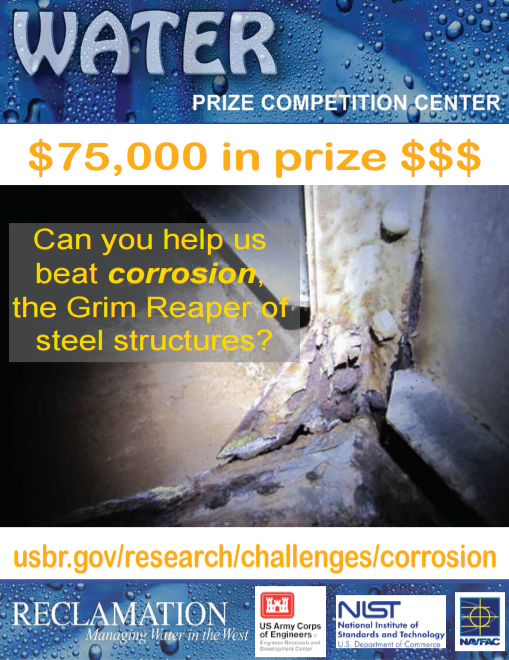 To learn more about prize competitions at Reclamation, please visit: https://www.usbr.gov/research/challenges/index.html.